Have you ever felt your spirit soar just watching someone on screen? Aaron Philip’s infectious laugh, can-do attitude, talent and faith radiate and lift everyone he touches. Check out this video of him speaking to the folks at Tumblr for a bit of his magic. Fourteen-year-old Aaron has already won fans around the world with Aaronverse, his Tumblr blog, that chronicles his life creating art, coping and thriving with cerebral palsy and achieving his dreams. 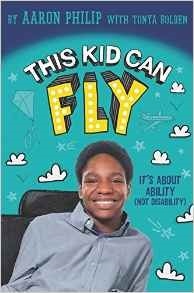 Now, he will move and motivate even more with his inspiring memoir, This Kid Can Fly: It’s About Ability (NOT Disability) (Balzer+Bray), that debuted on February 16. Written with award-winner Tonya Bolden and featuring photos and Aaron’s illustrations, it takes you through his amazing life from his homeland of Antigua to New York City. An open and heartfelt look at his struggles and successes, this debut title is a winner that will empower kids and adults to take flight too. Collaborating with Aaron was a remarkable experience. I learned so much about what people with disabilities have to contend with—sometimes EVERY SINGLE DAY! It’s my hope that Aaron’s book will make us all more considerate and compassionate. Why was his story one that needed to be told? Aaron’s story needed to be told because, as far as I know, a story like his isn’t out there. How many black boys have an opportunity to give people a front-row seat into their lives. How many people hear stories about brave black boys. How many young people with disabilities have we heard from? We so need to hear from young people first-hand if we are going to implement sound policies that affect them. Aaron’s story also needed to be told because his father, a black man, is his primary caregiver. There are millions of black men who go above and beyond for their families, but they are rarely written about. Mostly we get the stereotype of the Dad who cuts and runs when the going gets tough. What would you like people to know about Aaron? I would like people to know that Aaron is more than conqueror. We worked on the book while he was interviewing for high school. We worked on the book when he was getting over a cold. We worked on it before he received his new wheelchair and other equipment that helps reduce physical discomfort and pain. There were times we had to break from a session because he was exhausted, but he never complained, never once wimped out. I also want people to know that Aaron has a heart of gold and is the soul of patience. You have a super new book out and a wonderful Tumblr blog called Aaronverse. What inspired you to write your memoir and your blog? As you know, I have cerebral palsy, a physical disability that requires someone to help me with everyday things like bathing, getting dressed, going to the bathroom, and getting my books and computer out of my backpack when I’m in school. My book and Tumblr blog can help people understand more about what I go through and what families like mine go through. In my case, we’re immigrants who struggle greatly to make ends meet, and on top of that my family must manage my physical care 24/7. My parents must stay positive, focused and believe in me despite my physical challenges. My words share those triumphs and challenges with my readers. I wrote this book to help people understand that just because you have to use a wheelchair to get around or have a physical disability, it doesn’t mean you can’t dream like other kids. You still have talents and desires. This chair that I use to get around doesn’t define me or what I do in life. Malala Yousafzai is one of my heroes for sure. I get from her that if it looks like the cards are stacked up against you and still you rise, that’s something special, inspirational. She is one person who motivates me to be the best I can be and to keep on trying. I hope to meet her someday. Give her my number! Fred Seibert is also one of my heroes. He really took genuine interest in me and built me up in the process. I’ve never met someone as disarming and kindhearted as he is. Fred Seibert is someone who really sees me for ME, not my disability. I remember him telling me what he told Tumblr creator and CEO David Karp (also one of my heroes due to the fact that he created my biggest creative outlet, not to mention that he is incredibly sweet himself) as I left Frederator’s NYC headquarters for the first time, “Aaron, you can come visit me as many times as you’d like, as often as you’d like, until you’re bored!” I’m bored a lot. Obviously needing someone to help support me throughout the day. I can’t do many things by myself as my arms and hands don’t work very well. Also, pain management is hard. I don’t talk about my pain a lot. If you focus on the negative, nothing will get done. And for sure, combatting loneliness and isolation. Kids my age have tons of energy and run around. That’s not really my life, though I would love it to be. I work hard to find meaning and purpose in my life and use my strengths to stay positive. Finding a support system is key here. As the saying goes, “It takes a village.” All the things I wrote of in my book, the art classes at Children’s Museum of Arts where they have built a program around true inclusivity with the rights supports so that kids can socialize and learn how to make art and combat loneliness all at same time. Like going to an inclusive summer camp at Frost Valley. Like having opportltunities to speak at places like tumblr and Mercy College where I can share my story about what it’s like to be a kid with big dreams who also has major physical challenges that will be with me forever. Like sharing things about my life on my blog Aaronverse. All these things give my life meaning and purpose. What’s next for you? What’s your dream? I recognize, as Malala does, that education is key. I work hard in school because my dream is to attend a great university, study whatever it is that interests me at that time, and hopefully get a great paying job as I will need to earn a solid salary if I am to maintain my independence and help my family remain out of poverty. I hope to keep writing and making art. Please tell us about your creative process. What was the toughest part? Revisiting painful and frightening moments in my life was hard. Going back mentally to the homeless shelter my dad and I had to stay in for a while. Revisiting my dad’s had his heart attack and my wondering who would take care of me physically and what would happen to me and my brother if Dad passed away. Those were hard times to remember and share. What do you want kids to take away from your story? That if people like me, kids like me, are given the right supports, we can be productive members of society. If we don’t get those just right supports, our talents will go to waste. Such excellent buzz on this book I’m excited for the author and look forward to seeing more of his work.